This unit covers the Interactive Voice Response (IVR) Action ‘Call Transfer’. It covers all call targets and Auto Call Distribution (ACD) strategies apart from Round Robin Queue, which has its own training unit. Introductory Automated Message – this should inform the Caller what’s happening, for example ‘Transferring you to your account manager’. Round Robin – Calls each available Group member in turn. You can configure the number of repeats and the timeout given to each User. Simulring – Calls all available Group members simultaneously. You can configure the timeout given to each User. 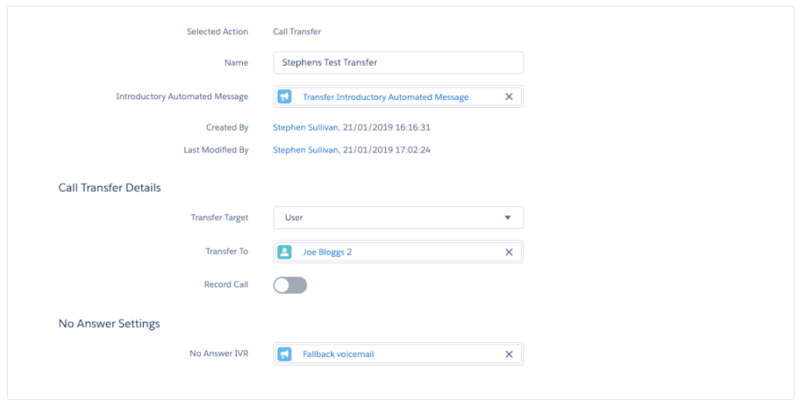 If the IVR is transfering to a Group, you must change the No Answer Settings to log the Missed Call to either a specific User or a Queue if Salesforce Omni-Channel is enabled.